Women Golden Blonde Long Wavy Curly Gold Full Hair Wigs Daily Cosplay Party 25"
· 1 x Premium Hair Hair Wig. Hair Net Type: Rose Net. · Hair Net 1(for your choice). Every one have their individual definition for colour, and under different conditions the colour will look different. 【 section number 】 : JF2038. · 1 x Premium Hair Hair Wig. High temperature wire wig can withstand the following high temperature 180 ° c, can not be hot dyeing, easy care, can be secondary modeling. Fashionable and stylish long hair wig looks natural, real, very pretty and feminine;. · 1 x Premium Hair Hair Wig. High temperature wire wig can withstand the following high temperature 180 ° c, can not be hot dyeing, easy care, can be secondary modeling. Fashionable and stylish long hair wig looks natural, real, very pretty and feminine;. 【 section number 】 : B047. · 1 x Premium Hair Hair Wig. High temperature wire wig can withstand the following high temperature 180 ° c, can not be hot dyeing, easy care, can be secondary modeling. Fashionable and stylish long hair wig looks natural, real, very pretty and feminine;. We will try our best to reduce the risk of the custom duties. Note: Due to the light and screen difference, the item's color may be slightly different from the pictures. Color：as the picture show. Hair material: high quality made fiber, synthetic hair. Style: Fashion Wigs. AAA High quality wigs. 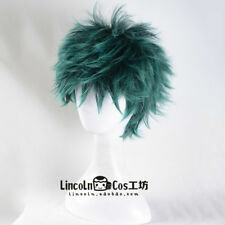 Hypnosis Mic Division Rap Battle Arisugawa Dice Cosplay Wig (Need Styled) Cap. Item Type: Wig. You can use the blower (cold air) or hair stick (better not high temperature) to change the style yourself You can cut or trim to the styles you like. Very stylish design with natural looking and soft touch. Including:1 wig 1 wig cap. Material is heat resistant synthetic fiber which can be styled by heat tool. It is both natural looking and soft touch. You can wear it to parties as well as for daily use. Item Style:Black Curly Wig. Style: Curly. Don't curl it or straighten it by using any hair machine. The cap is made of lace rose network,it is soft,breathable and have good elasticity. You can try different hair style,but needn’t go to the hair salon. It is only for wig. It need styled by yourself. Color :As picure show. This is a custom made braided wigs, with its ear to ear full lace wig and baby hair, all parts of the wig looks natural like a human scalp. lace cubic 3D corn row wigs with bleached knots. Wig is light weight and brown new. High quality synthetic fiber hair. - Material: synthetic fiber. - Easy to take care of. Synthetic wigs only need to be washed every 6-8 wears. 1 Piece Hair Wigs. 1 Piece Cap. - Long wavy style, brown color. Gift: Wig Web. Applicable head circumference: 52-56cm (with elastic fastener, adjustable size). Material: High temperature matte chemical hair.